Ready to schedule a live demo of Sage 100cloud? Jump down here. Sage 100cloud, developed for companies that need a wider range of features than “off the shelf” accounting software like QuickBooks can offer, Sage 100cloud (formerly Sage 100c, Sage 100 ERP and MAS 90) provides the flexibility to choose features and modules that best suit your current business needs – along with the flexibility to expand and add functionality as your business grows. Sage 100cloud is a subscription-based cloud-connected desktop solution that features a totally new and modernized user interface along with unique screen and desktop personalization options. The new interface is also designed around mobile technology to enable a more modern Sage 100 experience across multiple devices from your desktop or laptop to your mobile phone or tablet. Improve visibility throughout your business to make faster, more informed decisions. Get instant visibility across your business, boost productivity and improve your reporting with integrated business intelligence tools that create a comprehensive information management solution. Customizable report generation, inquiry, analysis, and integration applications work seamlessly with your Sage 100 solutions to enhance functionality. Improve lead time calculations, more accurate materials plans and better resource allocation. Maximize efficiency from forecasting to shop floor to completion with powerful manufacturing software modules. Power up your entire manufacturing process with manufacturing software that drives productivity and provides detailed, accurate tracking and reporting at every stage. Build customer loyalty, improve satisfaction and achieve a better ROI. Set new standards for customer service, improve loyalty and retention, and boost sales. Get immediate visibility to critical customer data and increase productivity throughout your business with real-time access. Create a more productive and satisfied workforce and reduce administrative time and expenses. Count on Sage’s industry-leading, comprehensive payroll management solutions to help you simplify payroll administration, automate tasks and ensure your payroll data is accurate and complete. Save time, reduce costs, improve security and establish your image as an environmentally conscious distribution business with Paperless Office for distributors. Quickly and efficiently email and fax documents to multiple contacts in any location to expedite communication, facilitate collaboration and improve customer and vendor satisfaction. Create, view, save and retrieve documents electronically in seconds and print only what you need—eliminating costly paper files, storage needs and misplaced items. Combine Sage 100 modules to build an ERP system that is optimized for your business needs! Experience the depth, functionality, and ease of use that Sage ERP offers. Provide an accounting foundation for your business that optimizes your productivity. Make significant strides in sales performance and customer service. Provide superior customer service by providing you with the ability to communicate more effectively, collaborate better internally, and compete in today’s marketplace. Provide a powerful programming interface for integration with third-party applications and facilitates interoperability between disparate systems over the network, including the Internet. Provide an affordable, out-of-the-box solution that can quickly and effectively bring your company online. Cut costs, manage your inventory, and streamline your warehouse operations like never before. Lead your company to increased efficiency and profitability. Have a complete solution for fully supporting one of your most vital assets: Your employees. Power up your entire manufacturing process with manufacturing software that drives productivity and provides detailed, accurate tracking and reporting at every stage – from forecasting to shop floor to completion. Create multi-level bills and produce accurate, informative reports detailing bill structures. Increase productivity and enhance functionality. Create an all-encompassing information management system for your business. Quickly generate reports, view vital company information, automatically consolidate data from multiple companies, divisions, and data sources for in-depth analysis. Keep your company, customers, and vendors “in the know” with automated triggered emails. Whitepaper – Why Does Customer-Centric ERP Matter? ERP is the back-bone of many businesses, connecting different silos in the business and providing companies with the ability to make better use of their resources while pursuing their objectives. This report will highlight the business value of customer-centric ERP. It will also observe several building blocks companies must establish in order to use ERP to become a true customer connected business. Access these white papers to learn more about Sage100cloud, ERP add-on’s and enhancements, the Cloud, general ERP concerns, inventory management, manufacturing improvements, and more. MAPADOC is a powerful, flexible, yet remarkably easy to use EDI (Electronic Data Interface) software solution integrated into the Sage 100cloud. Since it’s a scalable solution, you can start at any point and add the functionality you need – when you need it. Available in three configurations from simple turnkey to fully integrated supply chain solution, with editions for small business, standard, and enterprise, MAPADOC offers solutions that will meet both your requirements and your budget—that’s the power of choice. Leveraging our AP Automation expertise, SWK provides a level of software customization that few other vendors can. The integration between Sage 100 ERP and AvidXchange AP Automation software represents the only solution bridging complex Accounts Payable back-end processes and seamlessly passes Purchase Order invoice data from AvidXchange into your ERP solution. 80% of IT resources are spent on maintenance, not adding new value. Avoid spending your team’s valuable time on patching software, performing upgrades, and backing up data. The right HR management software can help the HR team increase control over employee data, optimize productivity, and take employee engagement to the next level, so you can deliver the future workforce your organization needs to succeed. To find an HRMS that’s a good fit for your business, evaluate solutions with the following five areas in mind. Time and Billing Solutions provide the tools that professional service companies need to bill time and expenses easily. Department managers can review and approve time and expense entries using the familiar Sage 100/Sage 100cloud interface, and your company can seamlessly push time/expense data to multiple modules, including Accounts Receivable, Job Cost, Payroll, and Sales Order. 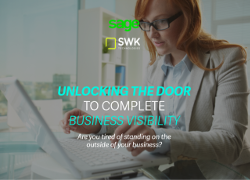 SWK Technologies, in partnership with Sage and Avalara, can address your sales tax challenges. AvaTax extends the power of Sage 100cloud with fully integrated end-to-end sales tax management automation. Cutting edge technologies and superior processing logic help manage even the most complicated tax issues. and money with powerful sales tax automation. Driven by the explosion of personal handheld devices, the usage of mobile devices is on the rise on the manufacturing floor, in the warehouse and in the field. There are tremendous benefits in implementing mobility, connected to an enterprise resource planning (ERP) system, as a part of your warehouse management solution. Learn how best-in-class companies stretch their inventory targets in terms of improved turns and better availability. When companies shift their energy from trying to manage every item to focus on what really makes a difference to the business, they open themselves up to growth by leaps and bounds. Sage ERP Document Management Suite electronically captures documents, streamlines business processes using workflow, automates the routing and distribution of all printed documents, reports and forms, and provides instant retrieval from the desktop or web. The purpose of this book is to provide executives with a non-technical guide to help them understand the benefits and capabilities of modern business intelligence (BI) suites and to assist them in the analysis their own organization’s current versus ideal-state capabilities to support optimal decision-making. By the time you have finished reading this book, you will be an executive-level expert on this topic so that you can help lead your management and project teams to select and deploy a business intelligence platform that will have a significant material impact on the performance of your business. FusionRMS POS for Sage 100 offers a suite of POS applications that integrate seamlessly with Sage 100. These applications simplify and enhance the end-user experience and extend the reach of Sage 100 without affecting the core functionality. 43% of small & medium business owners believe that getting better, timely reports and more information to drive down costs is one of the top three challenges they face in optimizing their business. Discover how improved visibility into your business can lead to immediate insights, enabling you to streamline decisions, grow collaboration, and increase profits. Then explore the 6 questions you need to answer before choosing your next business intelligence solution. Fill out some of your details below, and we’ll contact you shortly. Or, feel free to contact one of our customer account managers.